A total of 34,612 people have died in violence in Mexico since the government launched its crackdown on drug gangs, according to new government statistics. Unveiling a new database, President Felipe Calderon acknowledged that 2010, which saw 15,273 deaths, had been "a year of extreme violence". Half of the murders were in three northern states, officials said. The figures include the killings of gang members, police and troops, as well as bystanders. President Calderon, who launched his offensive against the drug gangs after taking office in December 2006, told a meeting of anti-crime groups that his government "was aware that it was going through a very difficult time on security issues". Government security spokesman Alejandro Poire said half of the killings had been carried out in three northern states: Chihuahua, Tamaulipas and Sinaloa. Other states, he explained, had been virtually untouched by the violence, with Yucatan and Tlaxcala registering fewer than 10 organised crime-related murders in 2010. Mr Poire said the northern states were particularly badly hit because they were at the centre of a battle between rival drug gangs. "There's evidence that this phenomenon is due to conflicts between different criminal groups passing more and more from drug trafficking to activities such as extortion, people trafficking and piracy," Mr Poire said. The government's database charts killings believed to be linked to organised crime and highlights areas where most of the violence is concentrated. 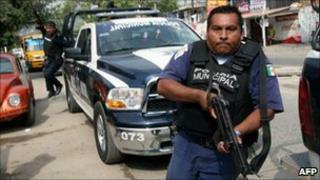 Last year, 70% of the murders took place in just 73 of the 2,456 municipalities across Mexico. There was a big jump in 2010 in the number of murders, up from 9,616 the year before to 15,273 - a rise of more than 60%. But Mr Poire also said the murder rate had dropped by 10% in the fourth quarter of the year. The BBC's Julian Miglierini in Mexico City says that the latest figures are the first comprehensive body count of murders linked to organised crime. The previous government figures released last month put the total number of dead at 30,196. The government says that the new figures show that the vast majority of those killed, some 90%, are suspected gang members, killed in turf wars between rival gangs.